These last few weeks before the actual exams I find myself trying to get inside the students’ heads to fashion their thoughts and channel their writing. ‘Meeting the needs of the examiner’ becomes the mantra; hitting the criteria for a ‘high-band’ mark, the imperative. For a number of years we have pounded in a mnemonic to do the job. English has PEE; History has ASK; our Geography team uses AUSLET (Accuracy, Understanding, Structure, Links, Examples, Terms)… meeting with a degree of success. But ‘success’ is usually compromised: it works in part, it works for some, it takes the answer so far. Having marked their ‘mock’ papers I was happy that some were getting into a sophisticated exam style, but others were missing the subtleties. And those were the students operating around the C-D bands. We could either do more of the same, or try a different technique. a) The making of statements that were pretty obvious and light-weight. Top-of-the-head type of stuff rather than well-considered points. b) Writing a point but not explaining it, not developing it, leaving it as ‘obvious’ to the examiner. c) Failing to put the sophistication keys into the lock to open the mid- to high-band marks with links, classifications, use of evidence and case-studies. d) Answers ending flat with no conclusion or sense of completion. 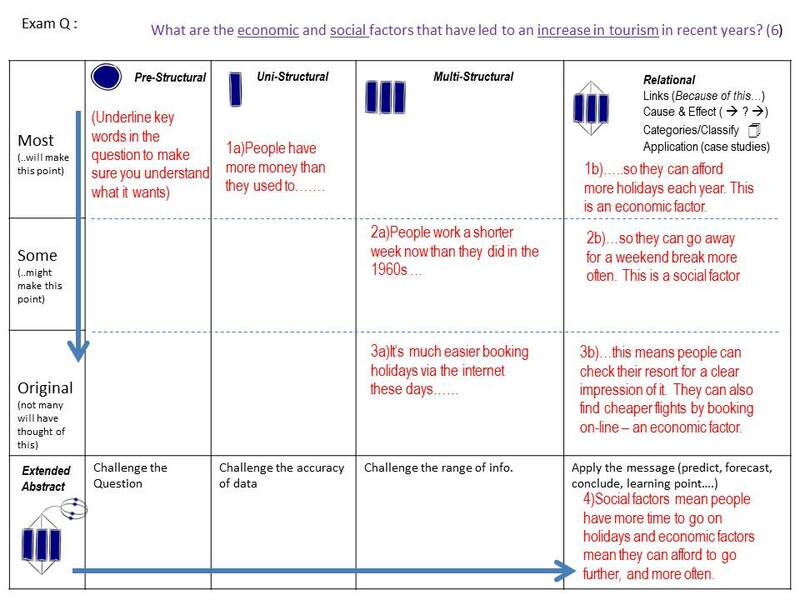 I hadn’t focused as much as I would have liked with this Year 11 group on SOLO; we’d introduced it and we’d used it in a couple of lessons aiming for depth and quality of point during note-making exercises but now I wanted to see if it could form an effective mental framework for structuring answers in the immediacy of the exam hall. I have found students absorb the SOLO symbols with relative ease and recall of them lingers well beyond our department mnemonic (they can rattle it off but that doesn’t mean it features in the construction of their answers). 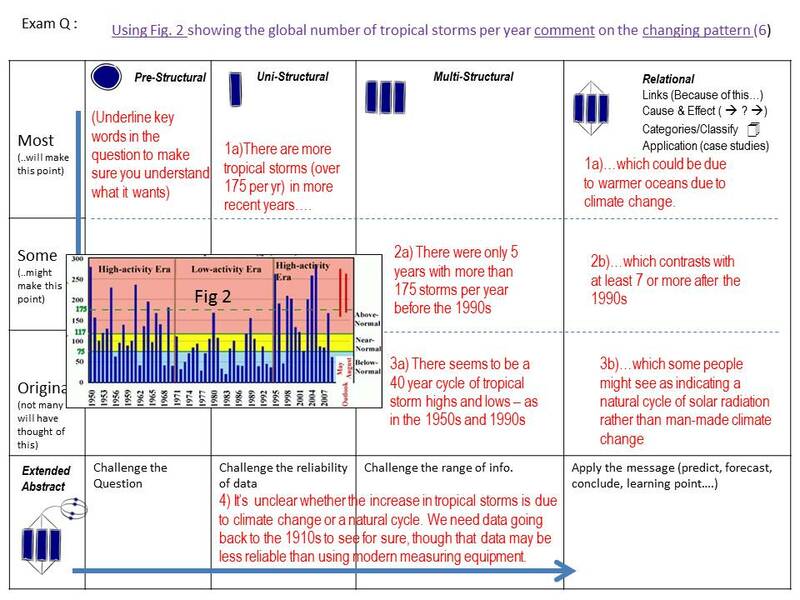 So I’ve used the framework here to format practice answers. It’s using SOLO as a planning template with visual cues to drive the sophistication of response. At Pre-structural students aim to interpret the exam question; they break it down to decipher it. This involves circling or underlining key words, command phrases and parameters. It’s about gaining confidence in understanding what the question is asking. Their first relevant point occupies the Uni-structural position. If it’s a fairly ‘obvious’ point – that’s fine, it’s a point that ‘most’ students might make in their answer, as long as they go on to ‘explain’ it – the ‘Relational’ column of cause/effect, links, exemplification or classification. It starts the ball rolling and avoids that calamity of leaving a question unanswered. Their second point I encourage to be something more perceptive; something not all students will make. It appears in the ‘Multi-structural column because now we’re building up breadth of points. But, again, it needs development – hence the Relational column development. For a third (or fourth) point the group are encouraged to push deeper into their knowledge and present a point that maybe only few other candidates would consider. Their quest for ‘originality’ starts to make their answer rich, offering a personalised perspective rather than the standard token resonse. And to complete the answer with a sturdy final sentance, the ‘Extended Absract’ row invites the student to comment on the frames of reference: a concluding summation, forecast, questioninng of data reliability or breadth of data used – an opportunity to show insight and indicate that they are looking at the world ‘through the eyes of a geographer’. There has been some twitter comment on the efficacy of SOLO in recent weeks. Is it a fad, a gimmick, a complication of the simple? A respected tweeter this week referred to it as “SO LOng. 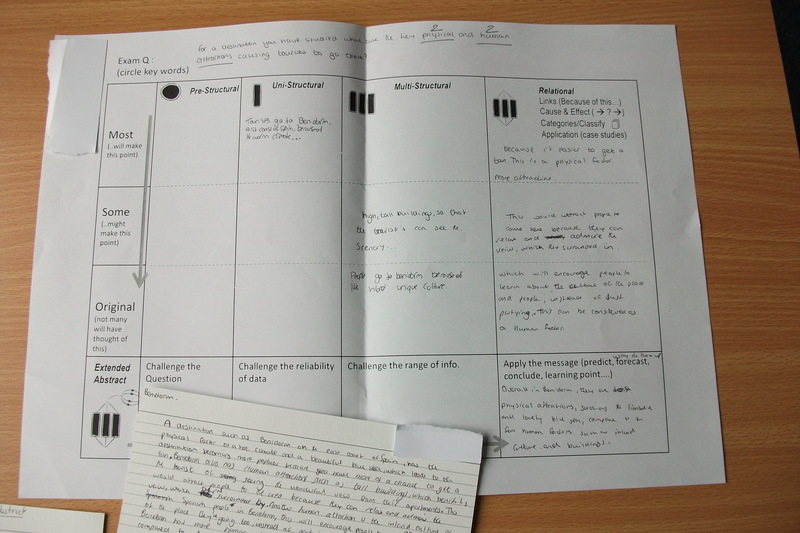 So waste of time.” I have to say the virtue is in the evidence as my mid-grade Y11s planned, drafted and cultivated layers of sophistication in their responses to an exam question using the structure. Would they have produced such rich answers without the SOLO frame? Well they rarely had before. After its use – it was a cascade of more geographically vibrant answers from not one, but a roomfull of students. Will they remember it in the exam room? The mock exam paper they sat this afternoon suggests ‘Yes’ – there are mental images there that they can hold on to in the exam hall to act as a route-map in the construction of high-mark garnering responses. Q: For a destination you have studied what are the physical and human attractions causing tourists to go there? A destination such as Benidorm on the east coast of Spain has the physical factors of a hot climate and a beautiful blue sea which leads to the destination becoming more popular because you have more of a chance to get a tan. Benidorm also has human attractions such as tall buildings, which benefits the tourist of seeing the wonderful view from their apartments. This would attract people to the area because they can relax and admire the view which they’re surrounded by. Another human attraction is the the inland culture of Spanish people in Benidorm such as Spanish dancing. This will encourage people to learn about the culture of the place they’re going to, instead of partying like many people do. Overall Benidorm has more human attractions such as the buildings and culture compared to the physical attractions of just the climate of the country. (This was Jack’s answer – a student that we’re hoping can get a C grade this summer but who has a record of middling D grades. This answer nails it). 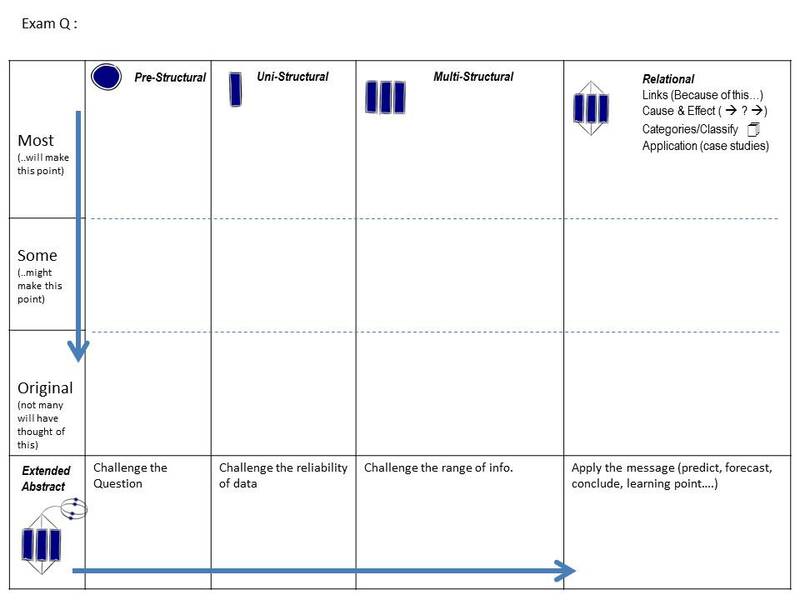 For a significant group of my Y11s I reckon this SOLO planning template is a valid routemap; something that can be held in mind and makes good use of the limited thinking time available in the exam hall. ‘Waste of time’? Nah. Techniques that help students bring out what’s there inside them – never a waste. 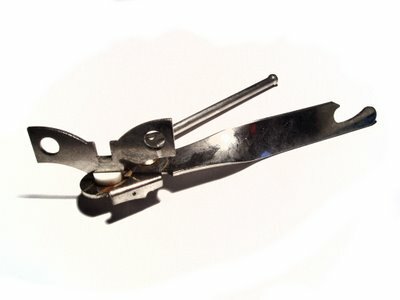 With the students I’m calling it the ‘can-opener’: it can open up (*groans* obligatory) their earnestly revised material and help translate it into a format that the examiners need to see to allocate the higher mark band. Does it make them ‘cleverer’? I think they’re clever already. Does it assist them in demonstrating that ability? Can but help.